If anything looked familiar about the main room that Carol and Maggie were held prisoner by the Saviors in, there’s a reason. 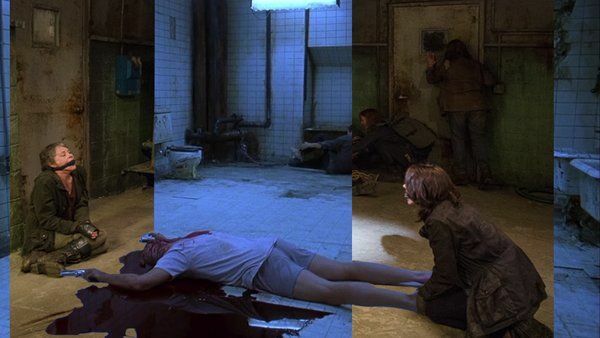 It’s the same room in which the majority of 2004’s horror movie Saw was shot. A comparison screen was made and circulated via Twitter last evening, originating from the official Walking Dead Twitter account. As you can see up above, the similarities are undeniable. It’s the same room. Now the question becomes if this was intentional or not. Given how similar many of the scenes looked, the fact that Carol and Maggie woke up bound and gagged….was this all an easter egg inside-joke for sharp-eyed viewers? Does this mean the Saw series happened in the Walking Dead universe (prior to the apocalypse evidently)? Did anyone spot a leg in that room?